We saw a movie! 2 movies actually! And movies that are not out on DVD. New (sort-of) movies. How did we accomplish this? Did we leave The Phi at home with Roo? No! We went to the Drive-In. 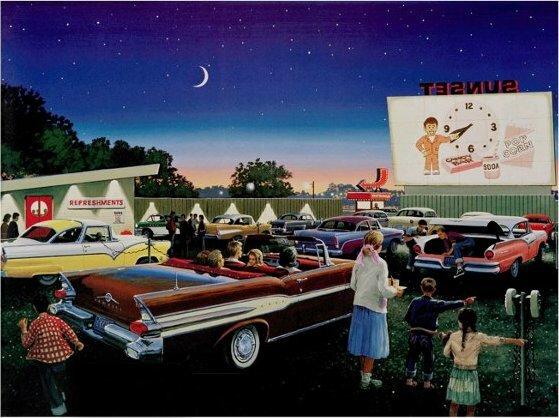 While Joey was on jury duty he took a different way home in a attempt to avoid some traffic and found the Van Buren Drive-In. So we headed out on Friday night to watch Talladega Nights and Nacho Libre. We stopped and filled up on snacks setteled into the Jeep to watch the show! It was pretty cool. I think the last movie I saw at a drive-in was Ghost, back when the 101 Drive-in still exsisted. You know before they tore it down to build a Barnes and Nobels. Anyways, the days of the metal speakers hanging from your window are gone. These days you just tune into a radio station and the sound comes through your car speakers. Wow! What will they think of next! The Phi did great. She sat and watched the first movie enjoying some cold refreshing milk. And she sat with us for the second movie. It was a lot of fun. Sunday was a good day too. We headed out to Orange County for the OC Market Place. We walked around and bought The Phi some new books. Then we headed to The Block for more walking and a late lunch. It was sort of wierd to be there. Everytime we go I remember one of the first times Joey and I hung out together, just him and I. We spent a whole day hanging out and ended up at The Block. I vividly remember being so happy to be hanging out with my cool new friend and having him actually talk. Getting to know him and being slightly nervous because I thought he was super cool and I was hoping that my nerdy self wouldn't say anything too geeky. We saw 50 First Dates and it was a really awesome day. It was that day that I knew that Joey was going to be a huge part of my life. I knew that I never wanted him to not be in my life. I knew that he was going to make my life better somehow. He was so cool and so wise and funny. And just a few years later we were there again. And Joey is still the coolest guy I know and now my best friend, the father of my daughter, and my husband, but I didnt have to be nervous because I know all about his nerdy side. And instead of walking side by side, we were walking side by side as he pushed The Phi is her stroller. And I leave you with The Phi at a restaurant, rocking out to the 80's music on the Muzak and eating some french fries. dang, she does things on command now. i miss u guys. i told cari to have the babies just so u guys would come down. i want to go to the drive in!